The Domaine Jacquiot is located in Plassac between Angouleme and Cognac. It's a small family-owned producer who makes cognacs and crème de fruits under the name Jahiot. He grows his own cassis on a Southern exposure hill and it's truly one of the best cassis we have ever tasted. He puts more fruit in the blend and lets the blend macerate for many months, and the result is a very tart and intense cassis taste (other producers will put less fruit and age for only a few weeks, and the result will be very sweet and syrupy). 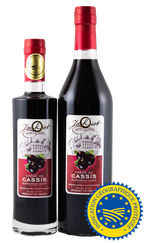 The blackcurrants used for Jahiot’s Blackcurrant Liqueur are grown exclusively on the estate. 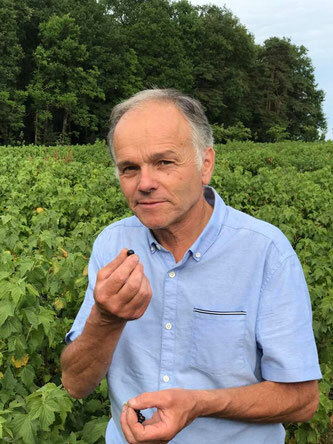 This way, the fruits can be picked when ideally ripe and quickly taken to the cellars where they will macerate in the finest alcohol, following a strict process to obtain the most appreciated flavors and aromas of freshly picked berries of Jahiot’s Blackcurrant Liqueur. The fruits have a strong aromatic quality and are highly concentrated. This traditional method of production gives to Jahiot’s Blackcurrant Liqueur all the flavors of old traditional blackcurrant. 5 stars! "Wow! Opaque, deep purple color. Initial whiffs detect wonderfully complex, astringent and uber-berry fragrances that are concentrated and delicate... Entry is tangy, deeply sweet, jammy and complex." "Tart and almost savory berry flavors are pungent in the glass. In the mouth there is a significant hit of savoriness as well, helping to balance out the bright sweetness of concentrated currants and other black berry flavors." 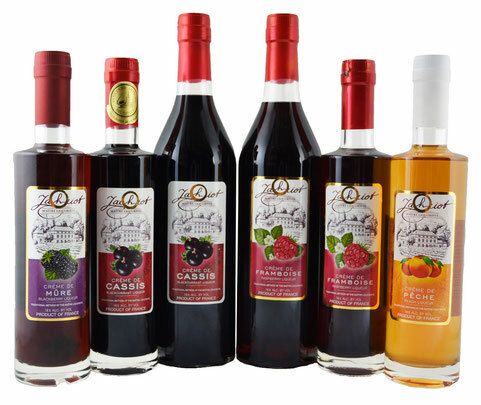 Jahiot’s Raspberry Liqueur is made from a very aromatic type of raspberry picked at the peak of maturity, delicately macerated in the finest alcohol and sugar. The fruits require great care and attention during the maceration process to preserve and reveal the raspberries' most subtle perfumes. It may be served pure, with ice or as a cocktail, with white wine or Champagne. It also offers many cooking possibilities. For a unique dessert alternative try it with ice cream, sorbet or a fruit salad. Jahiot’s Peach Liqueur is made on the domain from a very aromatic type of peach and natural flavor following a traditional method of production. With the high amount of real fruit used, Jahiot’s Peach Liqueur reveals the most appreciated intense taste of fresh sweet peaches. Serve well chilled, on the rocks, mixed as a cocktail or add a shot to your dry white wine or Champagne. Jahiot’s Peach Liqueur also offers great possibilities for cooking and will add superb flavor to your ice-creams, sorbets and other desserts. Jahiot’s Blackberry Liqueur is made on the domain from wild blackberries and natural flavors following a traditional method of production. The high concentration in fruits gives to Jahiot’s Blackberry Liqueur the succulent intense taste of fresh wild blackberries.